Its been a difficult day, not because of any one particular thing, but because of many things. I think about the tasks on my immediate “ToDo” list and none of them seem to keep my interest. I know I have a serious deadline that is about to pass me by. I know I have obligations at work that I need to address on a daily basis. I know there are things at home that have to be maintained and tended to, but then I cannot help but to think about the murder of Michael Brown, yet another young Black male shot down at the prime of his life. Shot down for no reason. I hear that he would have been off to college yesterday. I hear that he was a young man that was about change (if even for himself and immediate community). I hear that he said something along the lines of “my hands are up”. How is this possible? It seems like only minutes ago, another Black man, Eric Gardner was yelling about not being able to breathe, and now he too is dead. What does that mean today? What do these words mean, I thought they were ways to say STOP or TRUCE. But clearly, when you are face to face (or even running away) from someone that feels that you are a threat (even if you do not know why) it does not matter what words are spoken. I have to say that today was one of those days where I wanted to throw my hands up. I needed to write something, but didn’t want to write another “scared for my sons” kind of blog…but I ended up doing it anyway. The names keep multiplying, we are adding too many names to the list of victims, that I feel like I cannot keep up and that is not a good thing. I am hoping that these incidents do not make some of us become complacent, for now is the time to stop this from becoming common place. I cannot be complacent, I grew up in New York during a time that spanned the regimes of Mayors Koch, Dinkins and then Giuliani. I knew police brutality first hand and so did all of my friends. All of this was before 9/11 and all of this was when there were no campaigns to get to know your local police officer or campaigns to help you connect with your local precinct or see the NYPD as allies. It was the age of plungers and 41 shots, and it was scary. It has tainted how I feel about the police to this day and I am feeling those brutal dark memories resurface. Today, the town I live in is really small and ironically, I know my local police and they know me. There is no hate and my children know them and see them as people that are around to protect. However, I still teach caution. They are still young, but it doesn’t matter, I need them to know the truth and that truth is, that their trust in the police – even from their town can lead to death somewhere else, even with their hands up. 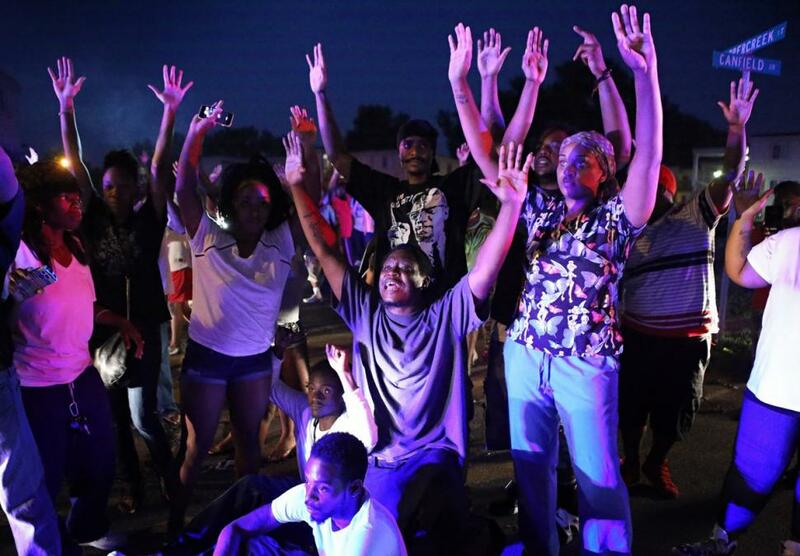 Missouri protestors with their hands up! So, after I put in a day’s work toward my goal to meet this pending deadline. I came home and hung out with my children and I turned on James Brown. It was quality time. We danced and we sang and we danced some more, because sometimes, you have to breathe,love your children and remember to bring truth to power and keep moving – with your hands up!